A man and his sons holding sticks with ash smeared on their faces standing outside the cattle byre (luak) in their homestead. Around them are their cattle tethered in the courtyard. A note on the print suggests that the location of this image is somewhere in western Nuerland. Note on print reverse ms pencil - "4 W. Nuer"
Morton, Chris. 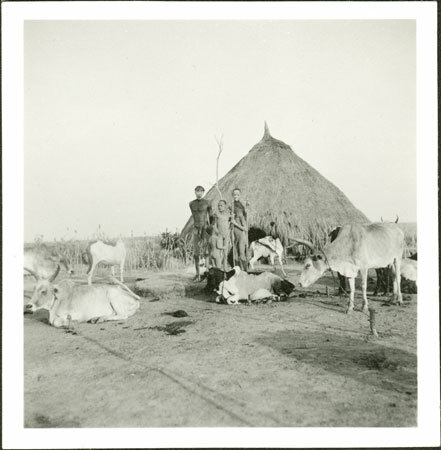 "Nuer homestead and family" Southern Sudan Project (in development). 03 Jan. 2006. Pitt Rivers Museum. <http://southernsudan.prm.ox.ac.uk/details/1998.346.214.2/>.